If anyone has any hints, tips or tricks for speediness, I would love to hear them. Equally, any tried, tested and loved cook books or recipes to guide me through my slow-cook journey would be most welcome! This is the third slow cook dish we have made..... I say 'we' because I am having to wrestle my new gadget away from my husband who has a bit of a tendency to think he is in charge of 'mains' and I regularly have to insist that I am cooking....... and no, he can't chop, stir or check the pot. Sure...... I am very lucky that I have a husband who loves to be in the kitchen as much as me, but it can also be a source of frustration, especially when we are fighting for shared work top space. And so to Sausage, Apple & Bean Casserole..... Warming, cheap, wholesome, full of great stuff and totally delicious. The ingredients listed serve at least 6 people, so there is plenty to go round (or in our case, heat up for another night....... yay! One less BP.....). It is deep and rich in flavour, and can be varied by adding different veg, mixing up the herb choice, adding extra spice or using veggie sausages if you don't want meat (in which case leave out the bacon too). It did require a fair amount of pre-prep with the browning of the sausages, and the frying of the bacon and veg, but having previously made a standard 'hob' version of this dish, I would definitely say that slow-cooking cut down overall direct input and the result was very satisfying. 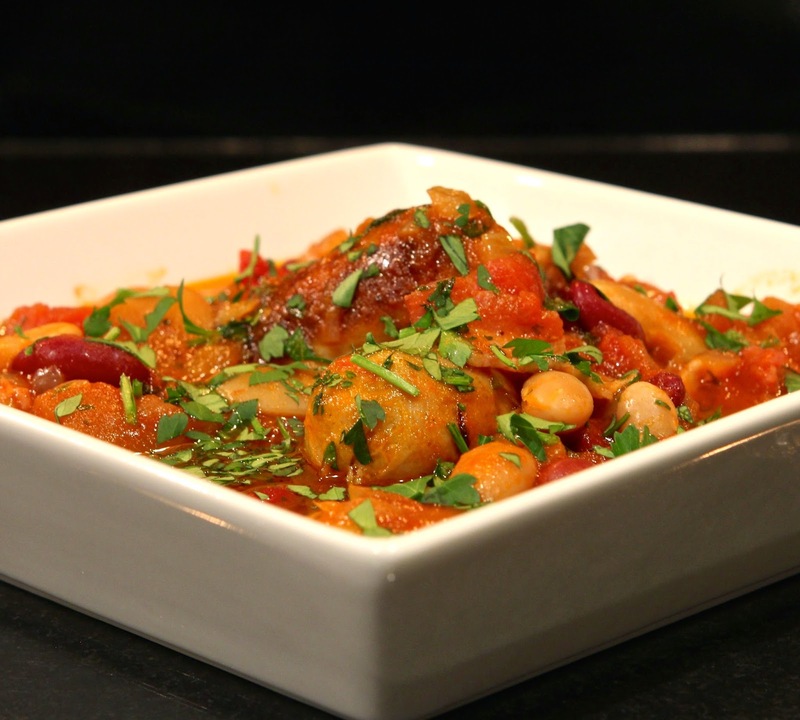 If you don't have a slow-cooker, no worries..... this can be prepared easily on the hob too! I kept the sausages whole and the mushrooms halved (you could leave these whole too) to give it goodly substance and interest. The apple adds a lovely fruitiness and a different texture dimension. The chilli (I used home-grown that we had dried at the end of the summer) contributed an extra warming, slightly spicy glow. 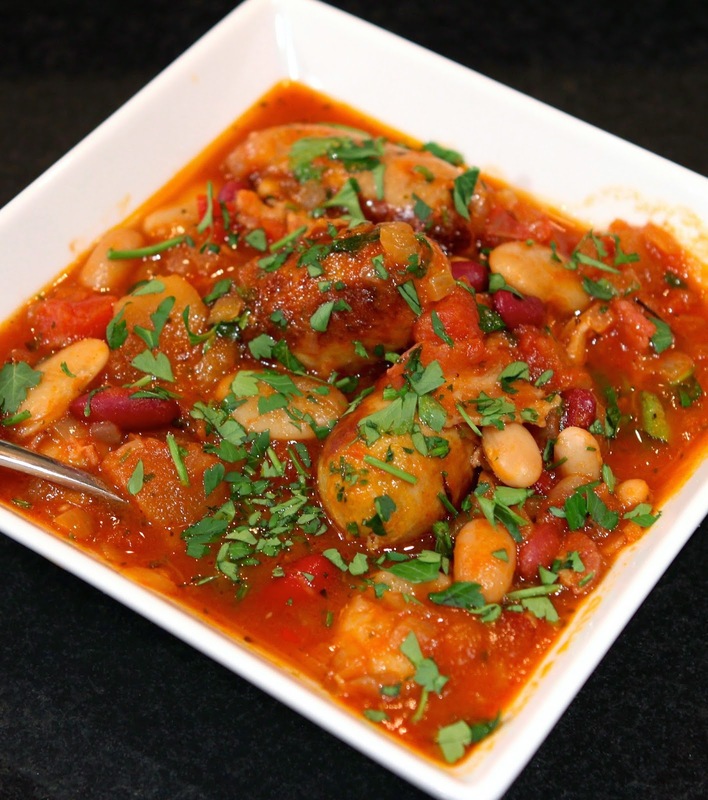 The beans (kidney, butter and cannellini) made it a wonderful, filling winter stew, perfect for these cold days and nights. The photos are pretty poor quality..... there are so few daylight hours right now and I simply don't have the time to organise myself (especially when there's hot food needing to be eaten). I am sending a portion each of this wonderful, healthy casserole to the following challenges this month so that (hopefully) lots more people will enjoy it as much as we have. Credit Crunch Munch with Helen at Fuss Free Flavours (and Fab Food 4 All). Portion for portion, this works out a good feed at a great price. And Recipe of the Week with Emily at A Mummy Too. 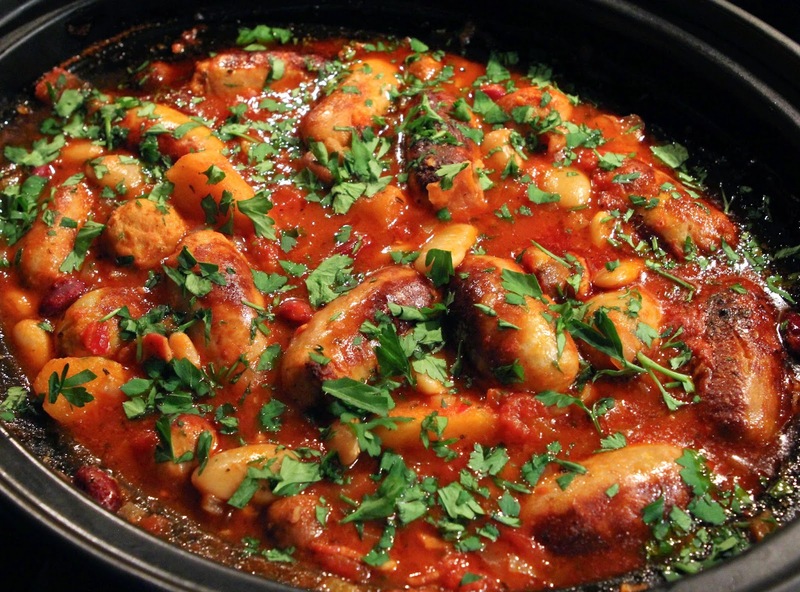 In a large frying pan (or in the casserole of the slow cooker if your model allows), heat the oil over a medium heat on the hob and fry the sausages, turning frequently until they are nicely browned on the outside. Remove from the pan and set aside on a plate with kitchen paper to drain any excess oil. Put the bacon and onion into the pan and fry for about 10 minutes, stirring occasionally. Add the garlic, apple, chilli and mushroom and cook for a further 2 to 3 minutes. Add the sugar and tomato puree, stir through and cook for a further 2 to 3 minutes. Add the cider and a handful of herbs, stir and bring to a simmer. Turn off the heat and put the sausages back into the pan. Add the tomatoes and beans and stir through. Make up the strong stock and pour into the pan so that the liquid is almost covering. Slow cook on high setting (according to manufacturer's instructions) for 3 hours. Sprinkle with chopped fresh parsley when ready to serve. love this!... I am so excited about this weekend and going home to cook in my slow-cooker, it's like a dream on a few days away!... LOVE the apple here, so chic! So tasty! Roll on the weekend!!! Thanks Dom! This looks wonderful, even if the light wasn't brilliant...you have still taken wonderful photos. Makes me want a slow cooker!! Thank you Vicki. So far I'm smitten with the slow cooker....... I think it is going to get a lot of use! So far root veg, mushrooms, peppers, squashes and potatoes have worked pretty well without going mushy, so I hold high hopes for veggie dishes! I checked out the Chulent. It looks interesting. I quite fancy giving it a go, but we can't eat Barley (glutenous). What do you reckon would be a good substitute? I saw Emily (AMummyToo) tweet this out and I'm definitely going to try it - sounds awesome. I love those square plates/dishes you have too. Thanks Nickie. Let me know what you think! The square plates came from either Sainsbury or Tesco! Oh lucky you to have a slow cooker. It is one of those must-have gadgets these days. This casserole must be really tasty. My dad always said to me "the pot has to boil on the stove to keep the family healthy". Fast and ready meals never taste good as properly slow cooked food! It's revolutionising life here for sure! It's so nice to come in to the wonderful aroma of a hot, healthy, delicious meal just waiting to be eaten...... Your Dad was clearly of the wise generation who knew good food! I love my slow cooker. Mine was the cheapest one from Argos at least 10 years ago (preblog) and it is still going strong. Perfect for winter time. I do beans and stock in mine too. Right now, it's definitely a favourite in my kitchen..... I think it is going to get a lot of use! Thanks Karen..... I'll take another plate full too! I finally purchased a slow cooker last year and LOVE it, particularly in these miserable dark and dank months. In fact it was pulled out today to make a tagine. 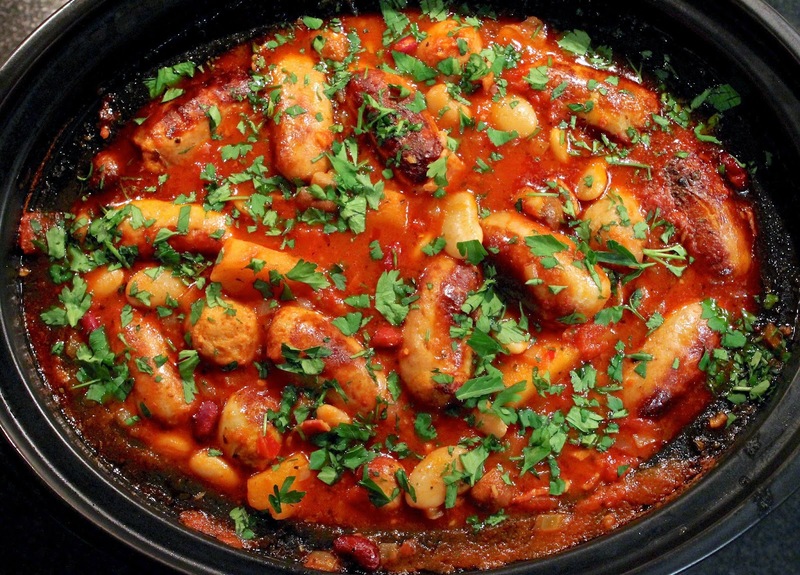 Your sausage & bean casserole looks the bus! And thanks so much for entering your recipe to the Family Foodies 'Healthy Kids' event. Good to share! I think my slow cooker is fast becoming one of my most used kitchen gadgets!